Paul Dunham Window Cleaning Services Ltd has quickly become one of Lincolnshire’s leading, independent, specialist window cleaning companies. As a growing business, we have worked consistently towards building an excellent reputation for supplying the highest level of service, whilst keeping our prices at a realistic and competitive level. cleaning, from small local residential blocks through to large corporate and commercial offices. We also specialise in more unusual projects, such as churches, stately homes, and a number of Listed Buildings. To see the area we cover see our Coverage Page. We are always researching new methods of cleaning, and we will find specialist techniques for those ‘non-standard’ jobs that other providers will not want to tackle. We will work with you to find the best method for you to achieve the finish you are looking for – whatever the job! We take great pride in our work, and always provide the highest quality service. 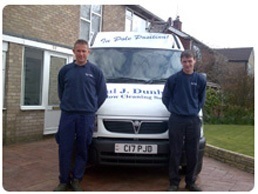 We do not contract out work and our staff are fully trained to meet the exacting standards expected of them. Appearance is an important factor which is why each member of the team wears the distinctive blue company uniform with embroidered logos in clear view. In a recent client survey, 99% of clients classed us as ‘Excellent’ in terms of results and service. It is on this reputation that we continue to grow our business. Call us now to arrange for an appointment to discuss your requirements – call 07793 030842 or email us at pd@pdwcs.co.uk.